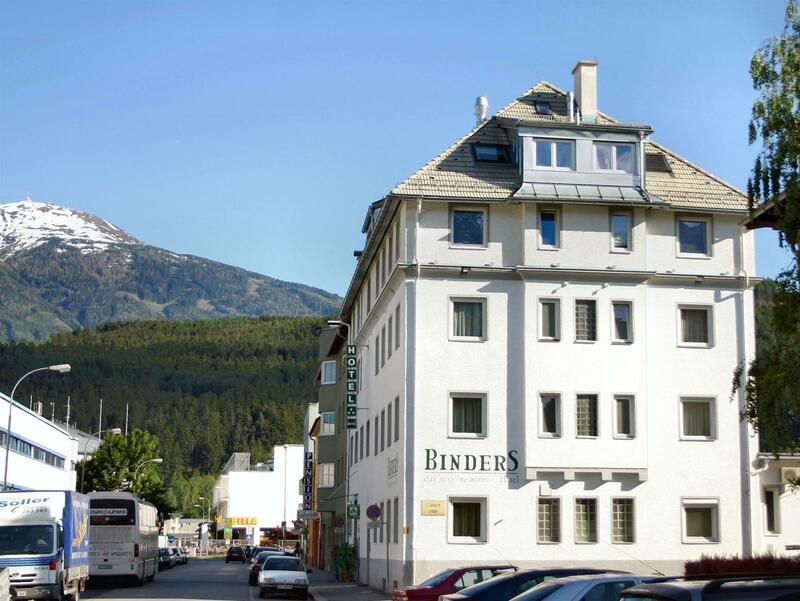 ﻿ Binders Budget City-Mountain Hotel Innsbruck. JIMAT di Agoda.com! Ada soalan mengenai Binders Budget City-Mountain Hotel? Sama ada anda melancong atau ke luar kawasan kerana kerja, Austria Classic Hotel Innsbruck Garni merupakan pilihan penginapan hebat ketika melawat Innsbruck. Dari sini, tetamu boleh menikmati akses mudah kepada semua yang bandar meriah ini boleh tawarkan. Bagi anda yang ingin pergi agak jauh, Innsbruck Tivoli NEU, Olympiaworld, Einkaufszentrum Sillpark merupakan beberapa daya tarikan untuk pelawat. Di Austria Classic Hotel Innsbruck Garni, perkhidmatan yang cemerlang dan kemudahan yang unggul menjadikan penginapan anda tidak dapat dilupakan. Kemudahan utama hotel termasuklah meja depan 24 jam, daftar masuk/daftar keluar ekspres, simpanan bagasi, Wi-Fi di tempat awam, tempat letak kereta. Semua bilik tetamu menawarkan pelbagai jenis tahap keselesaan. Banyak bilik turut menyediakan televisyen skrin rata, internet wayarles, internet wayarles (percuma), bilik larangan merokok, penyaman udara untuk memuaskan hati tetamu. Hotel ini menyediakan kemudahan rekreasi yang baik seperti pusat kecergasan, sauna, padang golf (dalam jarak 3 km) untuk membuat penginapan anda benar-benar tidak dapat dilupakan. Temui gabungan yang menarik antara perkhidmatan profesional dan pelbagai kemudahan yang ada di Austria Classic Hotel Innsbruck Garni. This hotel is quite dated, but I really appreciated their thought to the minor details. The breakfast was fantasic and catered to vegans with soy based custard and baked beans. I would definitely consider staying here again. The hard working staff do a fantastic job. Only guests that are booked directly with hotel will have free wifi in the room. For us who booked under Agoda or other agent, free wifi is only available at hotel lobby. I think the management should review this policy as everyone is a guest at the hotel REGARDLESS who they book from. This information on free wifi is pasted on the hotel lift, so it is a statement made to all guests. Very far from city center, no Internet, no breakfast unlike most other German hotels, and no air con. Good Liquid display TV screen and clean bathroom. My room was basically an attic so you sleep under a sloping roof. About 30mins from train terminal and city center, less choices at the breakfast and only one chinese buffet restaurant oppsite at the hotel. very quite at night time. Sights from room of the mountains and the buffet breakfast. a really nice hotel. located a little bit of a walk from the train station, is still easy enough to find since it's only 2 streets away (20 minute walking). the hotels rooftop rooms were fun, as they opened up to allow a wonderful view of innsbruck and the mountains that surround it. breakfast was great. large and tasty meals. the bar also was a nice little thing and much more preferable than going to a local bar where they were filled with cigarette smoke. The hotel is in a 'not so bad' location. There's a tram station at the end of the street where you can hop on to your desired destination but anything around that area isn't touristic. The hotel staff were very friendly, helpful and knowledgable. The food is good here too. The only downside of the hotel is that the rooms are very tiny. Maybe it's because we took the double budget room. The bed says double but is good enough for one person. This hotel is great if you're looking for an affordable place to stay and just to see Innsbruck's sights. Pretty far from both the train station and the center of the city (within walking distance, but not a no-brainer). No real nightlife immediately around the hotel. The room was well-appointed, with good materials, but the sound insulation was very poor for a four-star hotel. It also had a too-clever bathroom with translucent doors and windows into the room and lighting that would turn off on a timer, without an actual switch - annoying. The hotel is conveniently located 10-15 minutes walk from the city center. There are a couple of nice restaurants and cafes located nearby so if you are after a late dinner or an early breakfast you will find it! The hotel serves breakfast by the way. The most stunning feature of the hotel is the view from the top(5th) level rooms. These are the attic rooms with roof windows with the overview of the entire city and the Alps. You will love it at first sight! The only con we can think of is the hotel parking. There is no dedicated client parking and finding a spot nearby late night could be problematic. I advice this hotel if you want feel the real spirit and hospitality of Austria!!! The breakfast was not included in the price, would cost 7 Euro per person even for the kids. We skipped the breakfast at the hotel and went to Sillpark (a shopping center near the hotel) and ate breakfast there for lower price. We paid the brealfast by weighing it, before 10.30 you pay only 1.10 euro for 100g. I liked this hotel and the staff were friendly and could speak English. Kamar dengan kamar mandi sangat bersih, makanan pagi dengan banyak pilihan terletak tidak jauh dari pusat kota. Mencari dari pilihan Agoda untuk hotel dengan tarif ekonomis tapi bersih dan nyaman.